The Bergan dog car harness is one of the few safety tested dog seat belt systems currently sold in the UK. Until we found out about the Bergan dog car harness (back in 2010), we, like many just assumed that manufacturers of dog seat belt/harness systems would by law have to have their products undergo some measure of safety testing, especially given that all other car safety products have to pass rigorous testing. Shockingly, any one can make/sell a dog car safety harness without any testing whatsoever and claim it will keep your dog safe in the car. 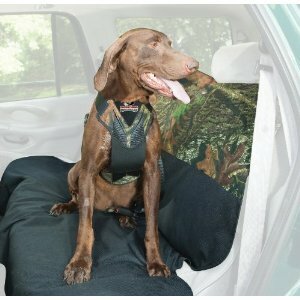 The truth is most of the flimsy nylon dog car harnesses that are sold, may give your dog a little protection, with some products being far better than others, but there is the likelihood of harness straps giving way, and certainly no guarantee of your dog staying safe in a car accident. 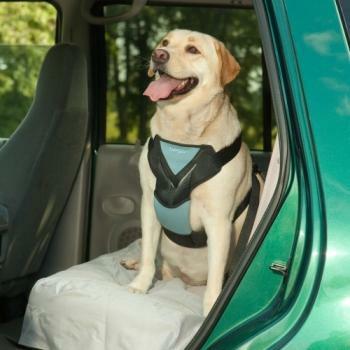 The untested dog car harnesses at best will keep your dog in one place but not necessarily if there’s an accident. The bigger the dog, the more strain is put on a harness, given some dogs weigh as much as humans. 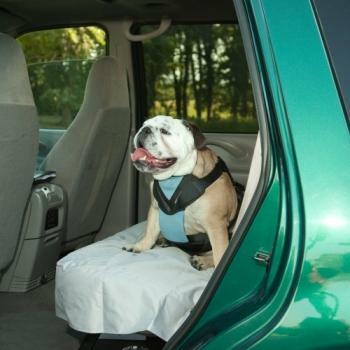 There is no point whatsoever in equipping your dog with a car harness unless, like the Bergan harness, it has qualified for crash testing, being of a robust, secure design. 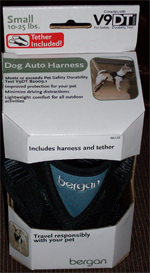 Bergan are an American company who specialise in pet auto safety products and dog harnesses and they are 1 of only a handful of manufacturers worldwide who have had their dog car harnesses tested. Bergan actually were the first company in the USA to pioneer and develop a crash testing facility, obviously being ahead of their time in 2010 and caring about our four-legged friends and their safety in the car- as well as the safety of us humans. Crash testing dog car harnesses is prohibitively expensive but Bergan have set a very important safety standard and hence in the States have become the choice of best dog car harness for responsible, caring dog owners who demand the same exacting safety standards for their dog as themselves and their children. We demand the same for our dog, if you do, read on. Our research complete and positive, we sent away for one of these Bergan dog seat belt systems from the US for our dog first to try out and review in 2010, both as a harness for the car and a walking dog harness, as that is another advantage, the product doubles up as both. We have been offering the Bergan car harness now for over 8 yrs with many satisfied customers, we are proud to say and very few returns. Why do we recommend Bergan ?? Well since 2010 until now 2018, we have constantly kept abreast of each new crash-tested dog car harness brand that has been brought out – we are well aware that there are other brands that have recently fared better in theoretic crash testing with dummy dogs than the Bergan. However, over the past few years we have tested these other brands and kindly some of our customers have road tested them too for us – mainly those customers who already had a Bergan car harness. The overall outcome was on 2 points where Bergan won – 1. sizing and 2. restriction. Sizing – with Bergan these harnesses come up to size 100% going only on weight of your dog, because they are uniquely 4 way adjustable – other brands did not become bestsellers as sizing was a major issue – how can a harness be safe in the car if your dog comes out of it ?? They cannot. Bergan harnesses come up to sizing so well and there being 4 sizes – every dog can be accommodated apart from tiny toy breed dogs. The second issue with the car harness brands that came out the very best for safety was they were deemed far too restrictive by real life users – actual real dog owners who were not using the harness with a rigid dummy dog – ie. the dog was tethered, fixed in 1 position and uncomfortable, resulting in a dog trying to fight off the harness/restrictive position, becoming agitated and the dog owner naturally upset on a car journey. These are real life. travelling with dogs issues. In the UK, the Highway code rules that dogs must be safely restrained in any moving vehicle, this is the law, for your protection and that of your dog. The unique thing about the Bergan dog car safety harness is the way it fixes both onto the harness and fits in the car for the small size Bergan, no other product uses this method, attaching to the same latch in your car where a child safety seat is fastened in – makes sense as child safety seats have to pass rigorous testing, as do the fitments in a car to which they are secured. 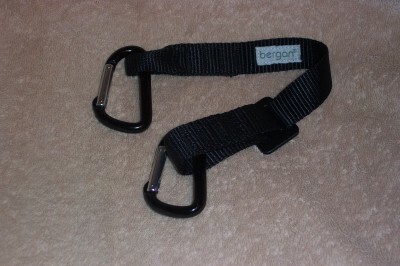 For the Medium/Large and XL size harness, Bergan recommend using the seat belt for fastening onto (see video) and equally, it is safe to simply plug-in your own seat belt into the normal socket and clip the carabiner around the actual seat belt webbing. Additionally the Bergan dog car harness is suitable to be attached to any secure anchor latch in a caravan,motor home, 4 x 4 vehicle or in the car boot of any estate car, making the product very versatile for different car owners and holidays where your dog gets to go too. The video below shows how to put the Bergan harness onto your dog (it’s a step-in dog car harness) and secondly how to secure the harness tether. Notice how the harness allows well for growing dogs, we don’t recommend cutting off too much of the harness strap if you have a puppy, just secure the excess for a few months. The Bergan is therefore an ideal puppy car/walking harness. The harness tether being adjustable is another unique feature, allowing you to adjust the freedom required for the size of your dog, for your dog’s comfort and making the product suitable for use with a booster cushion or dog car lookout seat, or your dog’s bean bag, dog bed, whatever would make your dog more comfortable on longer journeys. 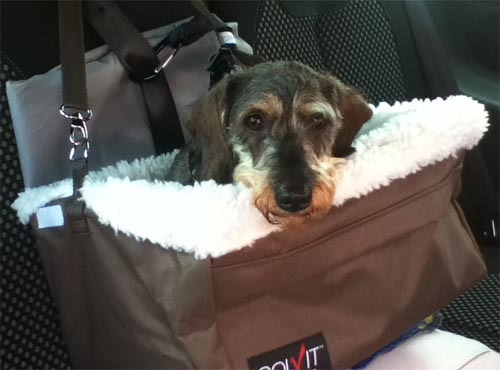 As we have a small dog, he likes to lookout of the window, so for long trips, we put his wicker basket bed on the back seat and use the Bergan dog car harness with the tether extended. Each different size harness has a different size tether too. If your dog is a chewer, replacement tether straps are available in all sizes. Because every size dog is a different height, unique to our website, you can choose which size tether you have with your size of dog car harness, to ensure your dog has ultimate safety and freedom as well as comfort without being restricted unnecessarily. Tethers do not permit enough freedom to roam around though, as this would defeat the safety objective. Not many manufacturers make really large XLarge (extra large) dog car harnesses, but Bergan have, the sizes go by your dog’s weight, as the harnesses are so very adjustable at all 4 points, which means the harness will last for longer. If you are looking for a small dog car harness, a Bergan will fit provided your dog/puppy is 10lbs or over. by Bergan for dogs upto 150lbs! We like the fact that the harness is wipe-clean, (very useful after muddy walks) it’s made from a type of breathable neoprene which feels nice to the touch, pliable and well-cushioned on the breast plate. Many people prefer a step in dog harness for the car and for walking, simply unhook the tether from the back of the harness, leaving it attached in the car and clip on your lead, saving you the trouble of refixing the tether to the car anchor fixings each time. We don’t have any children and wondered what do you do if you have a small dog and a baby/child safety seat? Simple there are 4 fittings in total along the back seat of a car, 2 needed for a child seat and only one fitting is used for a dog, so even if you have 2 small dogs and a child seat, it will work well, provided your dog is trained around your child. 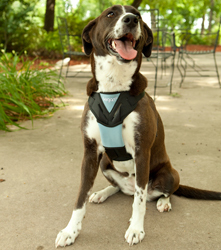 Bergan now have a Patent Pending on this unique harness that actually saves dogs lives. 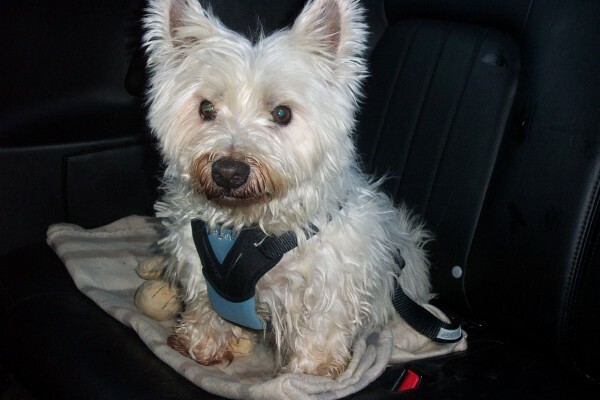 Read our own customer’s reviews of the best car harness for dogs by Bergan.